A spot-on follow up question from Pimm Fox asked if this is “a situation in which the ECB is cutting off its nose to spite its face, because you can stick to rules for the sake of sticking to rules, but when you have a potential crisis, why wait for it to be a real crisis such as Italy, which the new government has pledged to spend a lot of money, to lower taxes, while they still have a huge government deficit. Why would the ECB do this.” The brief answer is that yes, it is, because sending the Euro and yields higher on ECB debt monetization concerns, only tends to destabilize the market, and sends a message to investors that the happy days are ending, in the process slamming confidence in asset returns, a process which usually translates into a sharp economic slowdown and eventually recession, or even depression if the adverse stimulus is large enough. As for the punchline, it came from Abramowicz, who doubled down on Pimm Fox’ question and asked if the “European economy can withstand the shock” of the ECB’s QE reversal, which would send trillions in debt from negative to positive yields. While the answer is clearly no, what is curious is that the ECB is actually tempting fate with the current “tightening” scare, which may send the Euro and bond yields far higher over the next few days, perhaps even to a point where Italy finds itself in dire need of a bailout… from the ECB. Then again, don’t be surprised if during next Thursday’s ECB press conference, Mario Draghi says that after discussing the end of QE, no decision has been made or will be made for a long time. At that moment, watch as the EUR and bond yields tumble, and the dollar resumes its relentless push higher. Mercantilism is a practice of conducting economic affairs that Europe practiced especially during the period between the 16th and 17th centuries. It’s the progenitor of colonialism and favors the idea that a state’s—or nation’s—power increases in direct proportion to its ability to export. The more a nation exports, producing a trade surplus, the stronger it becomes. The current “imperfection” of the euro stems from this concept. Germany has become a mercantilist power within a union of nation states (the EU) that had agreed to pursue common as well as national interests. The result has not only been an imbalance of trade; rather, it’s been a complete political and economic disparity. Some EU countries, of which Germany represents the best example, have also used their surplus to lower their inflation rate below the eurozone-accepted two-percent standard. Indeed, Germany’s trade surplus formula was predicated on a minimal increase in salaries—and reduced government spending on infrastructure and other public services. The result has been the accumulation of significant competitive advantages. Ironically, whenever the euro drops in value, Germany gains with respect to the PIGS. The products that make up the core of its surplus become even more competitive within and beyond the EU. That explains President Donald Trump’s ever more vociferous suggestions to ban the import of German cars in the United States. It’s no accident that Trump launched a literal trade war, focusing on Germany and China, just days before the start of the G7 Summit in Canada. Germany’s accumulated gains from the low inflation and the more competitive conditions allow it to literally “colonize” (financially speaking) the so-called less virtuous or “deficit” nations. Germany can buy up their best businesses and services. In the meantime, Germany has also acquired a political dominance to match its surplus within the EU itself. It can control the rules of the EU economy and influence their evolution. That’s why there are few options for the PIGS. And that’s why society and political discourse have deteriorated. The rise of the so-called populist—I prefer the term “protest”—parties, Left or Right, in countries like Italy is a trend destined to expand throughout the EU and cause irreparable fissures. If the EU does not change (and by change, I mean a downsizing of Germany’s stature), the fissures will be irreparable, and one or more states will leave, breaking the union. David Stockman is intensifying his bear case. President Ronald Reagan’s Office of Management and Budget director blames a bull market that’s getting longer in the tooth — paired with headwinds ranging from President Donald Trump’s leadership to fiscal policy decisions to questionable earnings. “I call this a daredevil market. It’s all risk and very little reward in the path ahead,” Stockman said Tuesday on CNBC’s “Futures Now.” “This market is just way, way over-priced for reality.” His thoughts came as the Nasdaq was reaching all-time highs again, while S&P 500 rose slightly but the Dow failed to extend its win streak to three days in a row. All it takes is some hollow words. The euro stayed near two-week highs against many of its rivals on Thursday, on rising bets the ECB may soon announce it will start winding down its massive bond purchase program. Jens Weidmann, the head of Germany’s central bank, said expectations the ECB would taper its bond-buying program by the end of this year were plausible while his Dutch counterpart, Klaas Knot, said there was no reason to continue a quantitative easing program. The trio of comments drove the euro to a two-week high of $1.1800 sharp. The common currency last traded at $1.1781, extending its gains so far this week to 1.15%. “In the near term, we are likely to see event-driven trading on the euro. We should expect the euro to jump 100 pips (one cent) quite easily on comments from key officials,” said Kyosuke Suzuki, director of forex at Societe Generale. The ECB has been debating whether to end the unprecedented 2.55 trillion euro ($2.99 trillion) bond purchase program this year as the threat of deflation has passed. Still many market players were surprised by the flurry of comments as they had thought uncertainty caused by a political crisis in Italy could make policymakers cautious about indicating an end to stimulus at its policy meeting on June 14. Indeed, the yield spread of Italian debt to German Bunds widened on Wednesday as Italian bonds are seen as the biggest beneficiary of the ECB’s buying. “This euro buying is essentially short-term trade. People don’t know when Italian debt problems will be solved but they do know when the ECB might announce an exit from stimulus,” said Mitsuo Imaizumi, chief currency strategist at Daiwa Securities. But then Europe and Japan signal they’ll do the same. On the same day that the governor of Malaysia’s central bank quit, and just days after Urjit Patel, governor of the Reserve Bank of India, took the unprecedented step of writing an oped to the Federal Reserve, begging the US central bank to step tightening monetary conditions, and shrinking its balance sheet, thereby creating a global dollar shortage which has slammed emerging markets (and forced India into an unexpected rate hike overnight), Indonesia’s new central bank chief joined his Indian counterpart in calling on the Federal Reserve to be “more mindful” of the global repercussions of policy tightening amid the ongoing rout in emerging markets. As Bloomberg reports, in his first interview with international media since he took office two weeks ago, Bank Indonesia Governor Perry Warjiyo echoed what Patel said just days earlier, namely that the pace of the Fed’s balance sheet reduction was a key issue for central bankers across emerging markets. As a reminder, the RBI Governor made exactly the same comments earlier this week, arguing that slowing the pace of stimulus withdrawal at a time when the US Treasury is doubling down on debt issuance, would support global growth, as the alternative would be an emerging markets crisis that would spill over into developed markets. Get the hell out. Take their powers away. The Federal Reserve will likely raise its target interest rate to above the rate of inflation for the first time in a decade next week, igniting a new debate: when to stop. The Fed has been gradually hiking rates since late 2015 with little sign of tighter conditions hampering economic recovery. The expected June increase will raise the stakes as the Fed seeks to sustain the second-longest U.S. expansion on record while continuing to edge rates higher. With inflation still tame, policymakers are aiming for a “neutral” rate that neither slows nor speeds economic growth. But estimates of neutral are imprecise, and as interest rates top inflation and enter positive “real” territory, analysts feel the Fed is at higher risk of going too far and actually crimping the recovery. The Fed is “gradually entering a new world when rates are at 2 percent,” nearing zero on a real basis and approaching where they are no longer felt to be stimulating economic activity, said Thomas Costerg, senior U.S. economist at Pictet Wealth Management. The last time rates moved into positive real territory on a sustained basis was the spring of 2005 when the Fed began tightening rapidly after a period of arguably too-lax monetary policy, ending just months before the start of the 2007-2009 financial crisis. The debate over the current cycle’s end point “came earlier than I expected,” Costerg said, with the Fed facing imminent calls on where the neutral rate of interest lies. Opaque topic, but this is obviously not good. Medicare’s finances were downgraded in a new report from the program’s trustees Tuesday, while the projection for Social Security’s stayed the same as last year. Medicare’s hospital insurance fund will be depleted in 2026, said the trustees who oversee the benefit program in an annual report. That is three years earlier than projected last year. This year, like last year, Social Security’s trustees said the program’s two trust funds would be depleted in 2034. For the first time since 1982, Social Security has to dip into the trust fund to pay for the program this year. It should be stressed that the reports don’t indicate that benefits disappear in those years. After 2034, Social Security’s trustees said tax income would be sufficient to pay about three-quarters of retirees’ benefits. Congress could at any time choose to pay for the benefits through the general fund. Medicare beneficiaries also wouldn’t face an immediate cut after the trust fund is depleted in 2026. The trustees said the share of benefits that can be paid from revenues will decline to 78% in 2039. That share rises again to 85% in 2092. The hospital fund is financed mainly through payroll taxes. Social Security trustees said that reserves for the fund that pays disability benefits would be exhausted in 2032. Combined with the fund that pays benefits to retirees, all Social Security reserves would be exhausted by 2034, they said. The opioid crisis has become a significant public health emergency for many Americans, especially for millennials, so much so that one out of every five deaths among young adults is related to opioids, suggested a new report. The study is called “The Burden of Opioid-Related Mortality in the United States,” published Friday in JAMA. Researchers from St. Michael’s Hospital in Toronto, Ontario, found that all opiate deaths — which accounts for natural opiates, semi-synthetic/ humanmade opioids, and fully synthetic/ humanmade opioids — have increased a mindboggling 292% from 2001 through 2016, with one in every 65 deaths related to opioids by 2016. Men represented 70% of all opioid-related deaths by 2016, and the number was astronomically higher for millennials (24 and 35 years of age). According to the study, one out of every five deaths among millennials in the United States is related to opioids. In contrast, opioid-related deaths for the same cohort accounted for 4% of all deaths in 2001. Moreover, it gets worse; the second most impacted group was 15 to 24-year-olds, which suggests, the opioid epidemic is now ripping through Generation Z (born after 1995). In 2016, nearly 12.4% of all deaths in this age group were attributed to opioids. “Despite the amount of attention that has been placed on this public health issue, we are increasingly seeing the devastating impact that early loss of life from opioids is having across the United States,” said Dr. Tara Gomes, a scientist in the Li Ka Shing Knowledge Institute of St. Michael’s. “In the absence of a multidisciplinary approach to this issue that combines access to treatment, harm reduction and education, this crisis will impact the U.S. for generations,” she added. Over the 15-year period, more than 335,000 opioid-related deaths were recorded in the United States that met the study’s criteria. Researchers said this number is an increase of 345% from 9,489 in 2001 (33.3 deaths per million population) to 42, 245 in 2016 (130.7 deaths per million population). This is the first paragraph of The Times article (paywall) regarding Britain’s now famous Doomsday Brexit plan. “Britain would be hit with shortages of medicine, fuel and food within a fortnight if the UK tries to leave the European Union without a deal, according to a Doomsday Brexit scenario drawn up by senior civil servants for David Davis.” The Times confirms that the port of Dover will collapse “on day one” if Britain crashes out of the EU, leading to critical shortages of supplies. This was the middle of three scenarios put forward by senior advisors. A type of best guestimate if you like. You simply do not want to know the outcome of the worst of those three scenarios. Indeed, we have been spared from such details. Let’s not worry about the fact that French borders are often left in chaos due to the all too familiar strikes that appear almost monthly during holiday season for one reason or another. Home secretary Sajid Javid makes an unconvincing comment stating he’s ‘confident’ a deal will be done. That’s hardly the type of assurance we need is it? UK officials emphasised that the June EU summit due on the 28th was heading for a “car crash” because “no progress has been made since March” to devise plans for a long-term deal. If your confidence in Brexit is starting to wane, don’t worry, half the nation are not just anxious but downright fearful – mainly because, neither in or out has given any concreate evidence of likely outcomes. This is probably because Brexit hasn’t been done before – and was designed that way. Deliberately. At what stage of their hapless fiddling, constant arguing and pitiful attempts to administer the kiss of life to the corpse that Brexit has turned out to be, does a politician officially earn the title of – stupid idiot? “Just bloody get on with it” shout the Brexiteers, except both they and the UK government still can’t decide what ‘it’ is. I’ve asked it before: where will Britain be 10 years from now? Nearly 4 million adults in the UK have been forced to use food banks due to ”shocking” levels of deprivation, figures have revealed for the first time. An exclusive poll commissioned by The Independent reveals one in 14 Britons has had to use a food bank, with similar numbers also forced to skip meals and borrow money as austerity measures leave them “penniless with nowhere to turn”. The findings come as a major report by the Joseph Rowntree Foundation (JRF) shows more than 1.5 million people were destitute in the UK last year alone, a figure higher than the populations of Liverpool and Birmingham combined. This includes 365,000 children, with experts warning that social security policy changes under the Tory government were leading to “destitution by design”. Destitution is defined as people lacking two “essential needs”, such as food or housing. The polling on food poverty, from a representative sample of 1,050 UK adults carried out for The Independent by D-CYFOR, suggests that 7 per cent of the adult population – or 3.7 million people – have used a food bank to receive a meal. A million people have decreased the portion size of their child’s meal due to financial constraints, the survey says. The results come after it emerged in April that the number of emergency meals handed out at food banks had risen at a higher rate than ever, soaring by 13 per cent in a year, with more than 1.3 million three-day emergency food supplies given to people in crisis in the 12 months to March. I haven’t read the book -and it’s not out yet- but this seems, let’s say, naive. If you figure that a constant increase in energy use is the culprit, how can you say renewable nergy is the solution, and not call for using less energy? Factories and farming remove as much nitrogen from the atmosphere as all of Earth’s natural processes, and the climate is changing fast because of carbon dioxide emissions from fossil fuel use. Beyond these grim statistics, the critical question is: will today’s interconnected mega-civilisation that allows 7.5 billion people to lead physically healthier and longer lives than at any time in our history continue from strength to strength? Or will we keep using more and more resources until human civilisation collapses? To answer this, we re-interpret human history using the tools of modern science, to provide a clearer view of the future. Tracing the ever-greater environmental impacts of different human societies since our march out of Africa, we found that there are just five broad types that have spread worldwide. Our original hunter-gatherer societies were followed by the agricultural revolution and new types of society beginning some 10,500 years ago. The next shift resulted from the formation of the first global economy, after Europeans arrived in the Americas in 1492, which was followed in the late 1700s by the new societies following the Industrial Revolution. The final type is today’s high-production consumer capitalist mode of living that emerged after WWII. A careful analysis shows that each successive mode of living is reliant on greater energy use, greater information and knowledge availability, and an increase in the human population, which together increase our collective agency. These insights help us think about avoiding the coming crash as our massive global economy doubles in size every 25 years, and on to the possibilities of a new and more sustainable sixth mode of living to replace consumer capitalism. Seen in this way, renewable energy for all takes on an importance beyond stopping climate breakdown; likewise free education and the internet for all has a significance beyond access to social media – as they empower women, which helps stabilise the population. This topic contains 11 replies, has 7 voices, and was last updated by Nassim 10 months, 2 weeks ago. Having been to sea, on a 40′ wooden double ender; I love that picture by Ivan Aivazovsky: Stormy Night at Sea 1850. If you figure that a constant increase in energy use is the culprit, how can you say renewable nergy is the solution, and not call for using less energy? I’m of a mind most just really don’t get it! Trapped in magical thinking; technology will save us. When in fact it’s the very technology, unbridled, that’s destroying us. We’re the problem; sadly ironic, no? Except they forgot they won’t get compliance, ultimately their new fiefdoms will default and throw them off. Germany is only rich because they’re owed money. What will they be when those states refuse to pay? These insights help us think about avoiding the coming crash as our massive global economy doubles in size every 25 years, and on to the possibilities of a new and more sustainable sixth mode of living to replace consumer capitalism. To usher in a new way of living today’s core dynamic of ever-greater production and consumption of goods and resources must also be broken, coupled with a societal focus on environmental repair. Universal Basic Income (UBI) is a policy whereby a financial payment is made to every citizen, unconditionally, without any obligation to work, at a level above their subsistence needs. Environmental repair could come from the simple but profound idea that we allocate half the Earth’s surface primarily for the benefit of other species. What happened? First the site went down, then came back without the article, then the article re-appeared without comments, especially Dr. D’s excellent response. Did feathers get ruffled? Fortunately, the whole was still open on our computer, so we were able to copy and save it in it’s entirety. Most excellent article, and painfully true. Thank you for all the kindness, especially the June 6 Debt Rattle ones. We’re going for an upgrade, towards a mobile friendly site (very necessary) , and I’m sure we’ll get there, but in the process last night , some comments were lost for the “Debt Rattle June 6” and the “Everything That Dies Does Not Come Back” articles. The latter even has a closed comments section.?Perque? that is beyond my scope. Let’s just get it done and over with. And cloudhidden, if you still got those comments saved somewhere, do please post them here and/or at the proper article. I would be much obliged. Here were the comments as we saved them. Thanks for that heroic thread Ilargi. Epic by all measure. Serious health research at the level https://www.worldlifeexpectancy.com provides is expensive. Cross cultural comparisons can be very complex and the data isn’t easily accessed via research skills alone. Much of it requires world class tech skills to find it, organize it and display it so it can be easily understood. We have those skills and are pleased to share them with you in a free and open environment so you can educate yourself and your children about health without constantly being interrupted by unsightly ads. 1,340 varieties? You have no idea how hard that is until you grow and store even 10 varieties, 5 pounds each. Seeds also don’t sit on the shelf like wing nuts, they perish rapidly and variably, and must be regrown every year or every few years. Must, or they go extinct. When grown, they will show variations from breeding, from climate or location unique to just that year, invariably changing them. So there is no “true” line, although we target the “true”. So we target the “true” and also target the breed for improvement, adding new things, different likes and dislikes and so on. If that’s not enough, each genome has wildly different parameters. Peas are simple and easy to breed, as Mendel showed, others like corn are not only huge and wildly variable, but must include new outside genes regularly or the vitality withers away. Some are under massive attack, like potato and tomato late blight. The old varieties may virtually cease to exist because they cannot live in a blighted new world, yet we attempt to keep the old varieties and add the resistance…but then they are no longer the former variety, and never will be again. Some seeds, like wheat, can be grown when recovered from the pyramids, others like celery might not germinate in just two years. Enough variables yet? The Old World was different indeed, no fruit trees like apples, no honeybees, no hayfields, it was a forest of cool pines, long grasses, and extinct species like elm and chestnut. The pollenating insects in that world were wasps, flies, and others, and squash can still use them, but not corn, which is a wind pollinator. But the bugs, the grass, the forest, were all entirely different, alien different, all new, all forgotten, and the Old World too, which borrowed corn, tomatoes, and others from Asia like oranges and soy, no longer the Europe of Roman oil, garum, and German greensauce and gruit ale. We think this is the “real world”, the world that might go extinct, but it isn’t. The world already went extinct in 1492 and many times before that when everything changed. This world is just one variation of a growth that has narrowed and may — or may not — widen again. We can, and probably will, for instance, resurrect Tasmanian and Caspian tigers, the woodland bison, the auroch, and the mammoth. At the same time, we may kill 500 new insects and never notice. We have no idea what fish existed, much less erased forever. So numerous it seemed men could walk on them, like Cod. You can do more than complain and can — one way or another — grow these plants, or even these animals, and leave them as potential — if no more — to your descendants. One thing from Bayer, the new worst-company-on-earth, is that owning seeds is already illegal in Europe. In Britain, so I hear, it is illegal to trade seed or give it away, as a means to own all living things as slaves. This follows on the heels of an attempt to patent all genes one by one, so that we ourselves will be patented by Bayer and ourselves become genetic property, buying permission to own even ourselves. I can only wish I were making this up. The inability to share or sow seeds without permission is quite challenging for heritage sites and museums to navigate, as they attempt to grow Shakespeare’s barley or thatching wheat. It would create a black market in seeds, in life itself, as dark as the heroin trade, something out of the darkest sci-fi movie, past Logan’s Run and THX1138. So this is the world we want? Apparently yes. No one cares in the slightest. There are no protests, no boycotts, no rebellions of these high edicts. No one pays sixpence more for the farmer down the road vs. Bayer and ADM. So who am I to say? If you take no action, am I to care and do it all for you? Apparently, yes, I am my brother’s keeper. Apparently I grind myself down in sun and rain and taxes to keep life going that no one will share, no one will help with, people shake their heads and fists at, and even were I to go to their houses and lift a new cornmeal or apricot to their lips, spit it out as blemished and unclean, much less drive 5 minutes and take free seeds and plant them. THAT, my friends, is how much people care about the mountain gorilla and the black rhino. So much that they would not lift a finger even to save a species or variety that will feed them gourmet for free at their own house if it would take 5 minutes longer than microwaving a Stouffer’s in a triple-plastic tray. And we’re going to Mars? If so, it were to make a similar hell there, so it is indeed going according to plan. Naturally, they had to slip in “Global Warming” somewhere – no proof needed – “with climate change also contributing” That should ensure they get plenty of funding. FWIW, most fish migrate and – just like coral but at a far far higher speed – they are free to breed and live in the more suitable places. 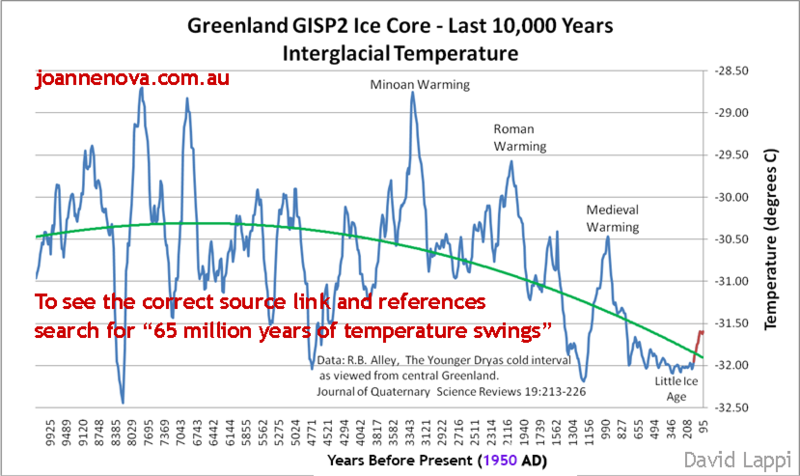 Here are the temperatures according to Greenland’s ice cores over the 10,000 years up to 1950. We are still a lot colder than during the Medieval Warm Period BTW.